Old Leader in the main yards in 2012. Her distinctive ear tags make her fairly easy to spot if she isn’t hiding in the back of the flock. In the four years since then, I have been mostly completely frustrated by Old Leader (which suggests that Frances Darlene might have been the most appropriate name), as she more often than not has declined to go in the direction I wanted. Her technique is simple: she circles to the back of the flock and turns invisible—to me, but more critically, to the rest of the sheep. They start casting about looking for her, and asking each other whether anyone has seen her. Once they spot her, they circle back as well. Family portrait–Old Leader with Alice (horns), Vicky, Clara and Felix all at the BACK of the flock when I was trying to shepherd them into some long grass. 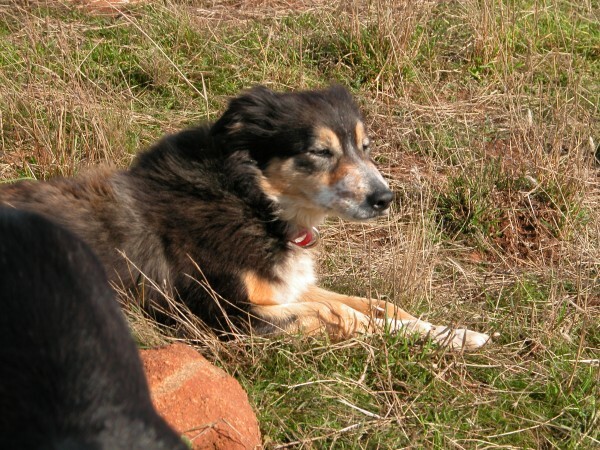 I once, memorably, spent two and a half hours in freezing rain moving the flock (with young lambs at foot) inch by painful inch through about 400 m of lucerne paddock toward the main yards, with Old Leader stubbornly at the back. Once safely past the yards and headed into a fresh paddock, she (and the flock right behind her) literally galloped ahead, covering the same distance in seconds. Waiting for Old Leader to decide to head off on the grazing circuit. We’d all been standing around for about 45 minutes at this point. It took another 15 before she chose to lead off. It’s not surprising, then, that Old Leader and I have had to come to terms over shepherding. And the result is just what you would expect, but has taken me several months to accept: without her cooperation, it just doesn’t happen. In the many hours I’ve spent holding the line and waiting for Old Leader to head in the general direction I’m trying to shepherd, I’ve had lots of time to contemplate just what is going on, and why it matters. On the grazing circuit–enjoying silver wattle. One insight came from a draft paper that Fred Provenza recently sent me, in which the behaviour of the oldest, non-breeding female elephants—the matriarchs—in game parks in Africa is explored. The matriarchs are responsible for the well-being of their extended families, carrying the knowledge required for everyone to thrive in their challenging environment. When one of those wise matriarchs dies, her family is less able to cope, bereft of her knowledge and leadership, until another leader emerges from within the family group. 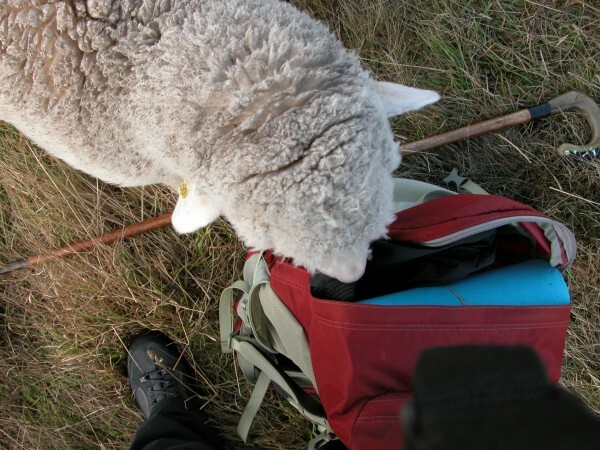 Georgie checking out my backpack while I was taking photos during a rest time in the grazing circuit. So, Old Leader, for whatever set of reasons, is the acknowledged wise woman of the flock. She is the one who decides where and when the flock will move to graze, whether it is safe to move into a new area, when to move to shelter and where that shelter is likely to be, relative to developing weather patterns. And the flock, accepting her leadership, move confidently behind her, and graze more actively as a result of her confidence. 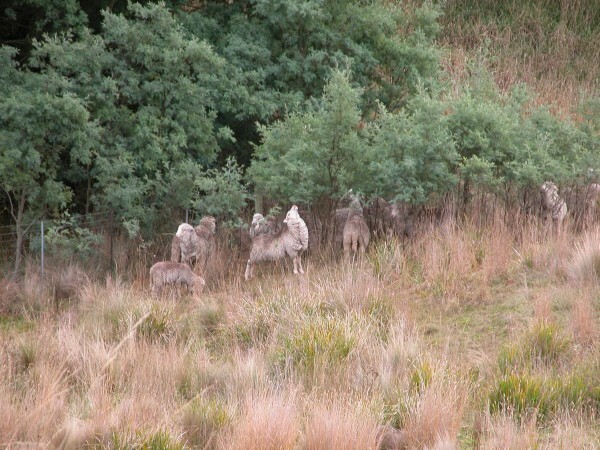 On the grazing circuit–spread out and trying all that the reserve has to offer in the way of diversity. Once Old Leader has headed willingly into the grazing circuit, there is a clear change in the grazing energy of the entire flock: they are more adventuresome, browsing pretty much everything that they come to, and sharing their discoveries with each other. Individual choice comes into play here, of course, but there is an overall feeling of interest in eating, and exploring food, that is reminiscent of a really good French restaurant out in the country—anticipation, enjoyment, unusual things to try, and the whole experience ending with diners feeling replete and satisfied. Close-up on the grazing circuit. Everyone is moving steadily up the hill, grazing as they go. The yellow gorse blossoms are a particular favourite. I’m waxing a bit poetic here, because I simply don’t know how else to describe grazing behaviour when the matriarch is leading. 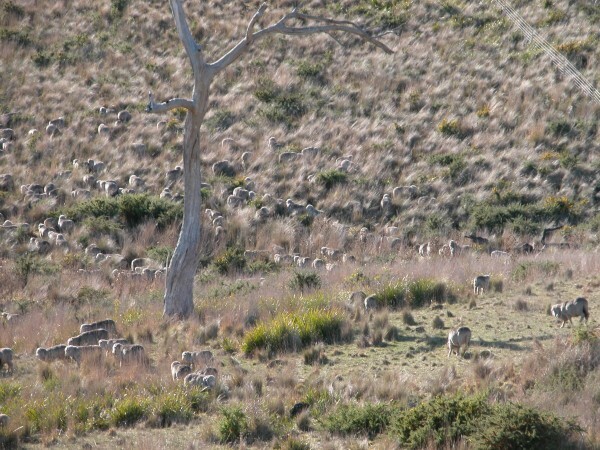 It’s completely different from the way sheep graze in a paddock when there is nothing much new or diverse, and they’ve been there for a while. In that case, the grazing is perfunctory, and the sheep are quieter, more sedentary, almost bored. 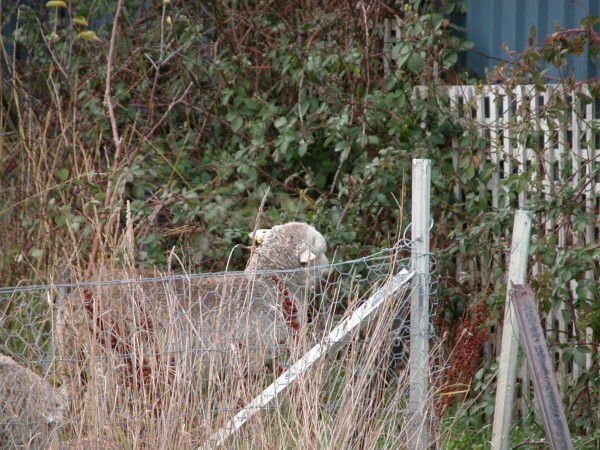 Lambs grazing the out-of-control blackberry bush in my veggie garden during a home paddock grazing circuit. One of the results of my hours of musing about the power of the matriarch was the realisation that I needed lots of matriarchs, not just Old Leader. That, in fact, I needed to let my flock as a whole age well past the canonical 5 years. 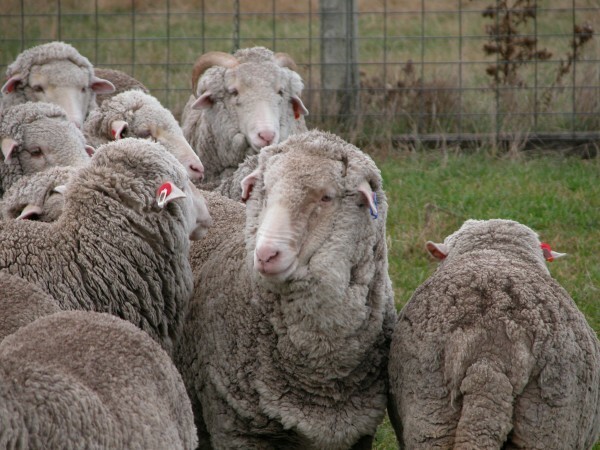 Merinos are among the most long-lived of sheep breeds, and I can expect mine to live to at least 10-12 years, growing good wool through that life span. (Alice is 10 and Old Leader is 9.) I don’t need to breed any ewes over the age of 5, and in fact I only need my ewes to provide me two lambs over their lifetimes to maintain my flock numbers. Janie having a well-deserved breather during a grazing circuit. I’ve started down this track by deciding not to breed lambs this year— I will just let the flock age by a year and keep the numbers constant. From a yarn perspective this move is a good one, as it is wool from grown sheep, not lambs, that goes to make my yarn. So next year, all 1000 sheep will be producing yarn fibre. I will decide in May of next year whether to lamb next year, and if so, how many. It will presumably be a relatively small number, which has a nice side benefit of letting me be extremely selective in the ewes I choose to have lambs. Once she decides to go…Sheep grazing with intent through the long grass. Old Leader would be out on the leading edge. In coming to respect Old Leader’s opinions on where and when the flock should move, I now understand why it is so blinking hard to get her to move in the direction of the shearing shed or the main yards. From a sheep’s perspective, those are areas of danger, and a far cry from that rustic French restaurant with checked tablecloths and robust red wine.